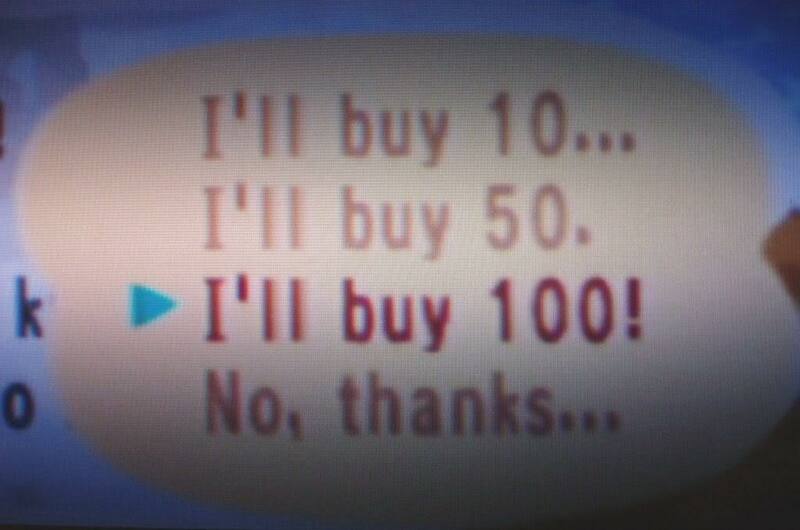 Trying to get your bank account to 999,999,999 Bells and earn a Post Office model? The easiest way to earn Bells quickly in Animal Crossing: GameCube is to buy and sell Turnips in, what is affectionately known as, the Stalk Market. If you play it right, you could end up with significantly more Bells than you started with. This can help you achieve that rare full bank account and the accolades that go with it. We hope that the following information on Turnips and the Stalk Market will help you reach that goal! In order to earn Bells, you must first invest some. Every Sunday, between 6:00am and 12:00pm, a boar named Joan can be found wandering in a random acre of your town. She is a Turnip seller and, upon being approached, will inform you of the price at which she is selling each Turnip. This pricing varies from week to week. Although the buying price given to you is per Turnip, Joan actually sells Turnips in bunches. You can choose to buy Turnips in bunches of 10, 50, or 100. If you have the funds, it is easier and more efficient to buy Turnips in bunches of 100. This enables you to carry more, and cuts down on a lot of work when buying and selling the Turnips. If you are buying only a few Turnips, the process isn't very hard. Simply approach Joan for a price per Turnip, work out how many Bells you need, and then go to the Post Office to withdraw enough Bells to buy your Turnips. However, if you want to buy Turnips in bulk, then you may need the following tips. To prepare for bulk buying, before proceeding to the Post Office you will need empty pockets and 10 letters, with no presents attached, in your letter slots. You can store up to 99,999 Bells in your Bells slot, and you can store bags of 30,000 Bells in each of your 15 inventory slots and each of your 10 letter slots. In total, you should be able to carry 849,999 Bells. Once you get within the same acre as Joan, drop most of your Bells in that acre in an area close to Joan. Beware when choosing your drop spot and buying Turnips! It is very important that you make sure you stay in the same acre as Joan while you are using up the Bells that you have brought to the acre. This is because once you leave the acre, Joan will go to a new acre and you will need to scour your town to find her again. Leave around 9 bags of Bells in your inventory and then talk to Joan. Begin buying Turnips in bunches of 100 until you run out of Bells or space in your pockets, whichever comes first. Once you are out of Bell bags, or space in your pockets, drop your Turnips somewhere in the same acre and grab some more Bells. 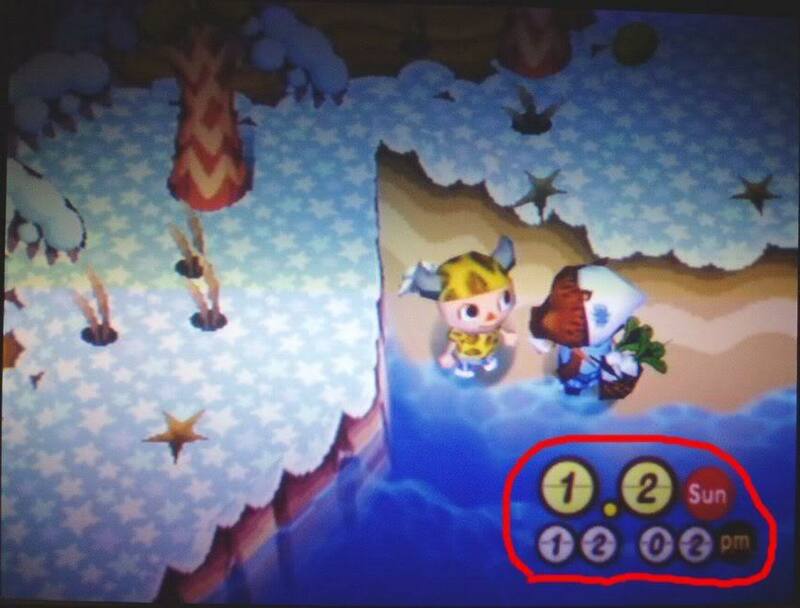 In order to speed up the process, adjust the number of Bells you bring depending on what you run out of first. If you run out of Bells then grab more Bells than last time, and if you run out of space then grab fewer Bells. You will eventually find a perfect balance where you run out of Bells and space at the same time. This will make the process much quicker. Continue doing this until you have used up all of the Bells you originally brought to the acre. If after using up your 849,999 Bells, you want to buy more Turnips, you will need to leave the acre to go grab more Bells from the Post Office. At that point you will need to find Joan again and repeat the purchasing process. Although Joan is scheduled to leave your town by 12pm, she won't actually leave while you are still in the same acre as her. This means that if it is just a few minutes until midday, it is still worth withdrawing another 849,999 Bells from the Post Office and finding her again to continue purchasing more Turnips. After playing on multiple Sunday mornings, you may notice that Joan has a few favorite acres that you should check first. Until then, just wander around until you find her. Once you are done for the day, it's time to decide what to do with your Turnips. You can either leave all of your Turnips on the ground where they are or move them closer to Tom Nook's store for easier selling later in the week, hopefully at a profit. It is recommended that you invest around 10-25% of your Bells in Turnips each week when you are first starting out. 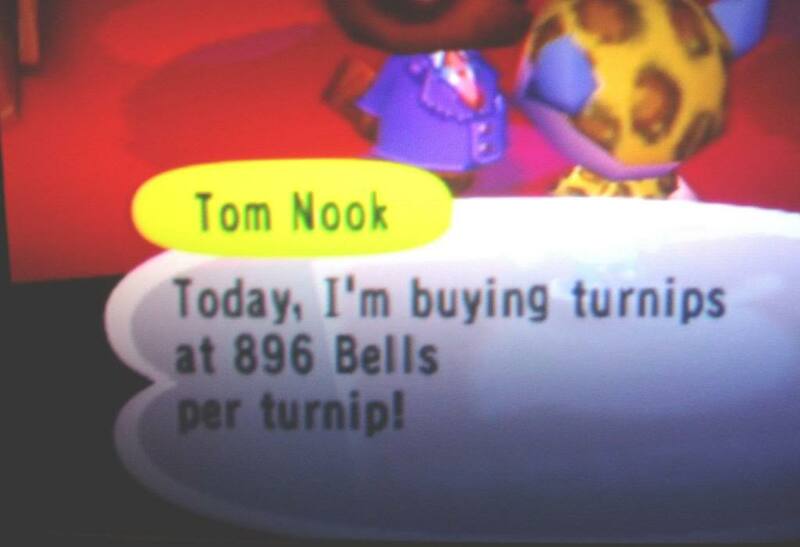 Once you have over 10 million Bells, you can start investing just about as much as you want in Turnips. Buying and selling Turnips is very time consuming, so eventually it will be time rather than Bells that prohibits you from investing more. The point of playing the Stalk Market is to make a profit. 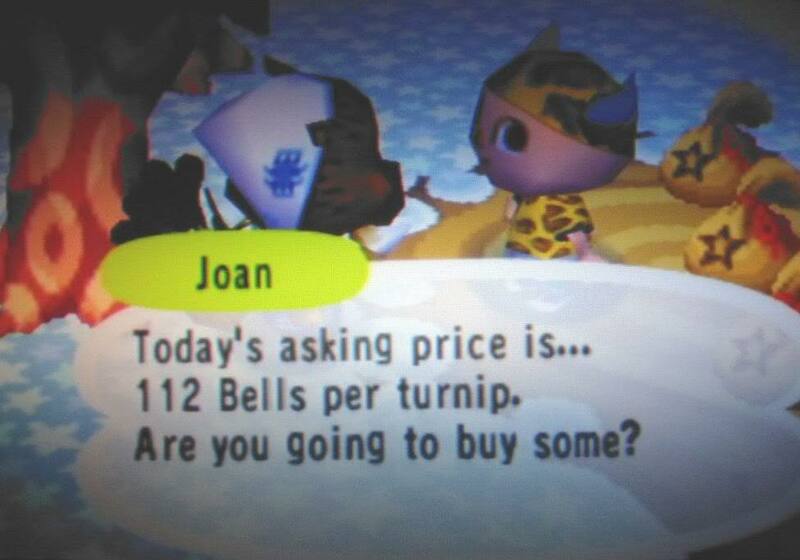 To do that, you need to sell your Turnips to Tom Nook for a price higher than you paid Joan. 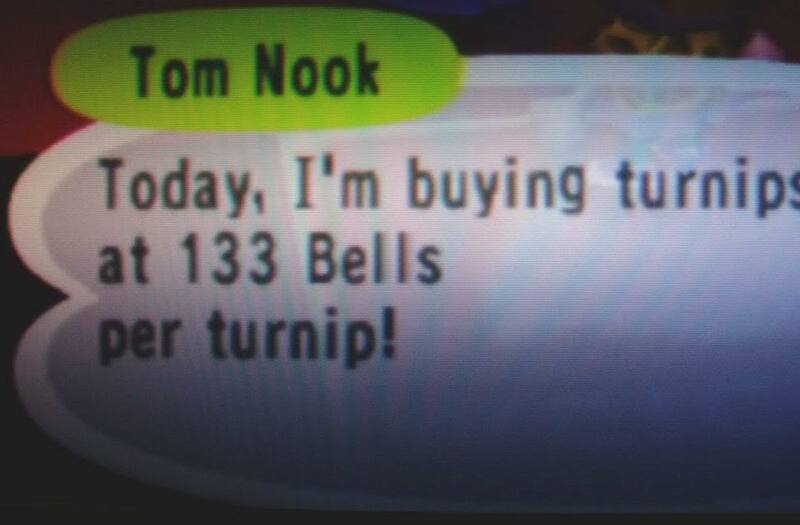 Tom Nook will buy Turnips on most days, but does not buy Turnips on Sundays, nor on a day where the raffle occurs. This means that in some weeks, you have 6 different days in which to sell Turnips and, on weeks where the raffle occurs on any day other than a Sunday, you will have only 5 chances to sell Turnips. In addition, each day that Tom Nook buys Turnips, the prices he offers will vary and you won't know in advance whether he will offer to buy the Turnips at a higher or lower price than that which you paid Joan. To inquire about the price that Tom Nook is offering for Turnips at a certain time, speak to him and ask for "other things", and then "turnip prices". He will then tell you the price at which he is currently buying Turnips. You may be tempted to sell all of your Turnips the first time that you see a price higher than that which you paid Joan, but the real profit to be made with Turnips is from price spikes. A price spike is when the price that Tom Nook is offering for your Turnips is exactly 8 times higher than the price you paid for them. For example, if you bought Turnips from Joan for 75 Bells each, the price spike will be when Tom Nook is offering you 600 Bells per Turnip. However, your town is not guaranteed a price spike on any particular week. On average, your town will have a price spike every 2-3 weeks. It is therefore important to check your Turnip prices daily because, while it is possible to make money by selling at any price higher than what you bought the Turnips for, the best way to make a huge profit is from a price spike. Unfortunately, Turnips spoil exactly a week after you bought them. Therefore, if it is Saturday, you should always sell all of your Turnips, even if you don't have a price spike. Waiting for a price spike until Saturday can also mean that you sell your Turnips for a loss. However, it is better to sell at a small loss than to lose everything by letting the Turnips spoil. Plus, a single price spike in another week can make up for 3 months without a price spike and therefore you will recoup your losses eventually. Alternatively, if you don't feel you can risk making a loss while waiting for a price spike, you can sell some of your Turnips on any day that Tom Nook offers you a price higher than you paid Joan. This way, if a price spike occurs later in the week then you can still take advantage of it with the rest of your Turnips. Conversely, if you end up selling at a loss, then at least you haven't made a loss on all of your Turnips. It is recommended that you track the price you bought Turnips for and all of the daily Turnip prices, even if you don't sell on those days. This will help you track patterns and calculate your net profits from the Stalk Market. If you are selling your Turnips at a price spike, you need to use some strategy. Tom Nook does not put Bells in presents for you, therefore you need to ensure you have room for Bells in your pockets. It is recommended that you take only 5 bunches of Turnips to Tom Nook in the first instance. If, after selling, you still have some space for Bells in your inventory, try taking 6 bunches of Turnips the next time. You will quickly find the perfect number to bring. If your Turnips are far away from Nook's store, fill up your pockets by picking up 15 bunches at a time and then drop some outside Nook's store. This will cut down your travel time significantly, since you only have to step outside to pick up the next two loads of Turnips. Continue this pattern until you have sold all of your Turnips. Traveling to another town or time traveling in your own town? Either way, you risk losing your entire investment. Turnips are highly sensitive vegetables, and it's not worth doing any sort of traveling if you've purchased any and are waiting on a price spike. While it might be tempting to time travel throughout the week until you find a price spike, it can also mess up the price patterns. If Tom Nook offered a reasonably high price for your Turnips on a day that has already ended, he won't necessarily still offer that same price if you time travel backwards to that same day. Traveling to another town while you have Turnips can potentially spoil them. It is generally safer when the time of your town and the time of the town you are traveling to are within a minute of each other, but it isn't guaranteed to be completely safe. Furthermore, due to the limited space in your pockets, traveling to another town slows down the process a lot. This generally makes playing the Stalk Market a chore instead of an enjoyable experience because you have to make the trip several times to take over the Turnips and to bring back the Bells. In addition, you will likely lose many villagers from traveling back and forth so many times.